It's pool season, the grandest of all seasons, or so you might think. Sure, days are longer, clothing is skimpier, and the beer is colder, but with pool season comes high risk, especially if there's poop in the water. Which, it turns out, there is. A lot of it. According to the CDC, every year thousands of water-associated outbreaks get reported, all stemming from poop-related bacteria. And poop in the pool can cause several diseases, all of which you can very realistically catch. The good news: despite what that ignorant guy at your office says, herpes and HIV are two diseases you CANNOT catch in a pool. The No. 1 pool-borne disease in the US is… number two. Diarrhea is the most common recreational water illness (RWI), and is most commonly caused by cryptosporidium parasites. "We know that cryptosporidium is the bug responsible for most of the recent recreational water-associated outbreaks," says Brittany Behm, spokeswoman of the Division of Foodborne, Waterborne, and Environmental Diseases for the CDC. "Half of the outbreaks reported for 2011-2012 were caused by crypto." Crypto can stay alive for days even in well-maintained pools. When these parasites enter your body, they travel to your small intestine and then burrow into the walls. The result? An unpleasant bathroom situation for as long as two to three weeks. Summer is only 13 weeks long. You don't want this. Another unsavory aqua lurker is the giardia parasite, which causes the diarrheal disease giardiasis. More diarrhea, fun. Giardia is a parasite that lives in the intestines and is passed on through poop, and it can survive up to 45 minutes even in the most highly chlorinated pools. Once infected with giardiasis, get ready for lots of lower intestinal backlash in the form of diarrhea, gas, greasy, floating stool (which is infinitely more gross than regular, non-floating stool), cramps, and dehydration. This aquatic antihero is a disease caused by a group of bacteria called shigella, and most who are infected with shigella develop -- you guessed it -- diarrhea. Add to that list a fever and stomach cramps that usually start a day or two after exposure. Shigella will clear itself up in five to seven days, and some people who are infected may not have any symptoms at all. Be careful if you're going on a cruise, because this is the virus that's responsible for most of the horrifying cruise ship stories that make the rounds each summer. It's highly contagious and is spread by contaminated food or water. And yes, pool water counts. Norovirus causes your stomach or intestines to get inflamed, which results in stomach pain, nausea, diarrhea, and vomiting… there's that pesky diarrhea again. You can get this plunderer of the lower intestine many ways, and contaminated swimming water is definitely one of them. 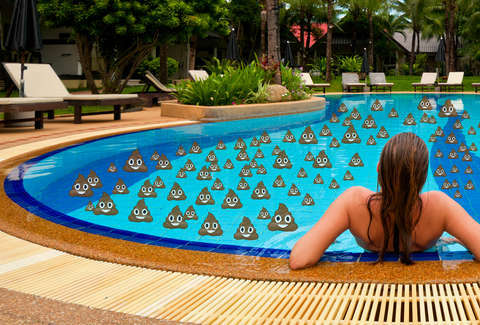 Especially if that swimming water is contaminated with infected poop, which it very well could be considering how many people seem to get diarrhea from infected swimming pools. When you have it you will experience severe diarrhea and abdominal cramps for five to 10 days. This is less of a pool disease and more of a hot tub disease, but it's equally real. Legionella is a type of bacterium found in fresh water and it causes illnesses like Legionnaires' disease and Pontiac fever, both of which sound pretty badass but are decidedly not. The good news is that most people exposed to the bacteria don't become ill -- if you do get Legionnaires' disease, however, you'll be looking at a severe form of pneumonia that would probably put a damper on the rest of your summer.